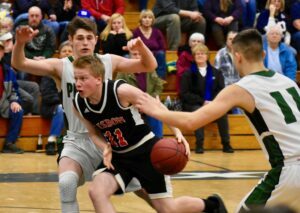 The Spruce Mountain boys' basketball team was able to pull out a 64-45 victory over the Lisbon Greyhounds before a noisy crowd at The Nest Monday, Feb. 4. 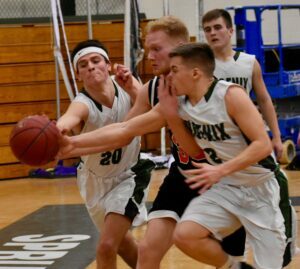 JAY — Spruce Mountain coach Scott Bessey immediately recognized the signs that his Phoenix were suffering from some kind of hangover in a boys’ basketball game against Lisbon on Monday night. 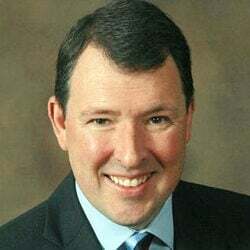 According to Bessey, his team appeared to be in a euphoric haze after beating Mountain Valley the other night, but this blissful state still didn’t stop the Phoenix (13-4) from dismissing the relentless Greyhounds (9-8) with a 64-45 victory before a noisy crowd at The Nest. “I think it was a classic hangover game,” Bessey said. “I don’t think we played that well. I thought we turned the ball over. I thought we missed a bunch of bunnies, missed a bunch of free-throws. Our free-throw shooting was bad. “I thought we were a little too full of ourselves after the Mountain Valley win — and Lisbon is a very physical team, very well-coached team. They have no pressure on them. They come in here and just play. I thought we were hungover from the Mountain Valley game. Lisbon demonstrated their run-and-gun fortitude and roused the Phoenix from their cloud-nine attitude in the first quarter, with Spruce holding on to a 13-9 lead. But a wake-up call from the voracious ‘Hounds startled the Phoenix, who entered the halftime break with a narrow 33-27 lead before opening up on Lisbon in the second half. 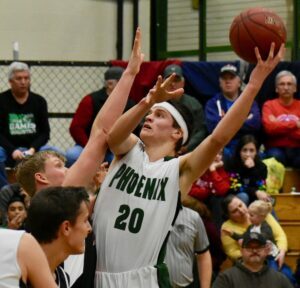 The Phoenix snapped out of it in the third quarter and reeled off 16 points while holding Lisbon to just six points. Spruce coasted in the fourth quarter with an encore 15-point performance. “I thought we played hard,” Lisbon coach Jake Gentle said. “We had flashes of executing offense pretty well. But we just have to put it together more consistently throughout the game. “Obviously, we didn’t protect the ball as well as we wished we had. Part of that was our own fault and part of that is Spruce Mountain’s pressure defense. They did a great job rotating in the back against us. They did a good job closing out. 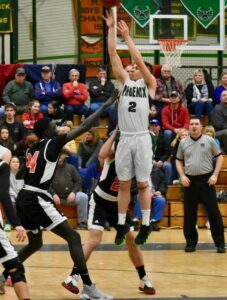 Spruce junior guard Brandon Frey lit up the scoreboard with the game-high 18 points, which included a pair of 3-pointers and several jump shots. Teammate and 6-foot-3 senior Andrew Shaw had his hands full inside the paint, but he still came away with 16 points. Senior forward Tate Walton harassed the Greyhounds on defense and made his contribution of 15 points. 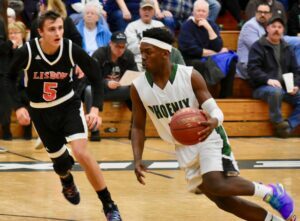 The Greyhounds certainly gave the Phoenix a tussle and leading the way on offense was junior guard Corey Weirs (four 3-pointers) with 14 points followed by junior guard DJ Douglass with 12 points.